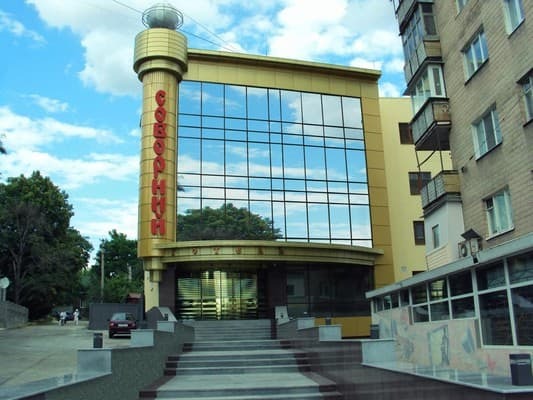 Hotel "Sobornyj" - a four-story luxury modern building with an independent high-tech heating and ventilation system, which is located in the heart of the city's founding Zaporozhye Lenin's prospect in the immediate vicinity of the railway and bus station. 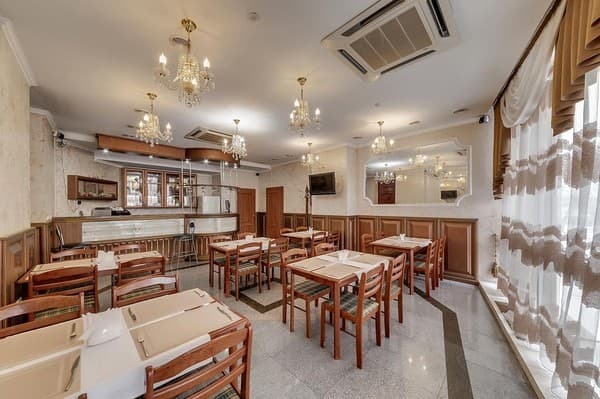 1 st floor of the hotel "Sobornyj" - elegant marble foyer, elegant cozy cafe with white tablecloths and expensive dishes. 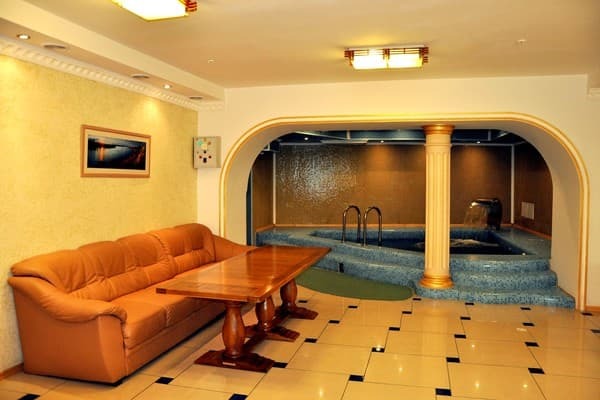 Ground floor - a large swimming pool with sauna and private massage rooms. 2,3,4 th floors - 16 rooms of different design class with the same expensive equipment. Hotel complex "Sobornyj", including the café and sauna, is working for you round the clock. For your peace of mind and convenience, the hotel has an indoor parking lot. 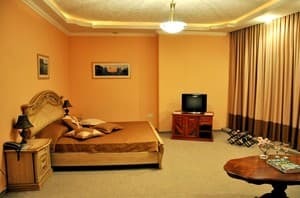 Description of the room: Room (area 28 m2) consists of one cozy room with two windows and a bathroom. In the room: mirror wardrobe, double bed with orthopedic mattress, 2 bedside tables, folding leather sofa, coffee table, minibar, safe, telephone. An iron and ironing board are available on request. The bathroom, except for the standard set of ceramics and mirrors, is equipped with a shower cabin, an electric towel dryer, a hairdryer, a set of home textiles: towels, a foot mat, terry robe, slippers. Also in the room there is a disposable set for personal hygiene: soap, shampoo, shower gel. Toothbrush, toothpaste - on request. 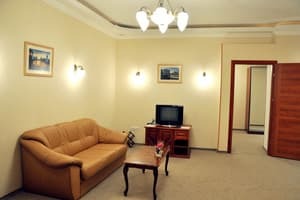 Description of the room: The apartment consists of two spacious cosy rooms and a bathroom. In one of the rooms there is a wardrobe for overclothes, a folding leather sofa, a leather arm-chair, a coffee table, a coffee set which consists of the table and two light arm-chairs, a TV-set (51 channels), mini-bar, a safe, a telephone, an access to the Internet. In the other room is situated a mirror sliding door wardrobe, a double bed with orthopaedic mattress, 2 bedside tables. The bathroom unit is equipped except the standard set of ceramics and a mirror with a shower cubicle, an electric heated towel rail, a hairdryer, a set of domestic textiles: a bath towel, a facial towel, a carpet for feet, a terry dressing gown, slippers. For Your comfort there is in the room a disposable set for bathing habits: soap, shampoo, shower cap, shower gel, toothbrush, toothpaste. Description of the room: The apartment consists of one big cosy room with a big floor-to-ceiling window, giving the view of the avenue and a bathroom. In such a room there is a mirror sliding door wardrobe, a double bed with orthopaedic mattress, 2 bedside tables, a folding leather sofa, a coffe table, a TV-set (51 channels), mini-bar, a safe, a telephone, an access to the Internet. The bathroom unit is equipped except the standard set of ceramics and a mirror with a shower cubicle, an electric heated towel rail, a hairdryer, a set of domestic textiles: a bath towel, a facial towel, a carpet for feet, a terry dressing gown, slippers. For Your comfort there is in the room a disposable set for bathing habits: soap, shampoo, shower cap, shower gel, toothbrush, toothpaste. Гостиница просто для переночевать. Обычный номер, со средним ремонтом. Отзывчивый персонал. Завтрак по сумме, запах в номере и санузле. Низкая шумоизоляция. Хорошая сауна, очень приветливый персонал (!). Вкусный завтрак. Свежие полотенца каждый день. Расположение: Недалеко от остановки транспорта. Завтраки нужно заказывать с вечера. В коридоре очень холодно. Старые кондиционеры. В номере было прохладно, кондиционер на тепло не помог. Персонал очень хороший, вкусный завтрак, по первому требования приносят в номер дополнительно белье, утюг, завтрак. Небольшой одноместный номер с окном на проспект. Понравилось обслуживание, удобное месторасположение отеля (недалеко от ЖД вокзала), а также завтрак, который уже включен в стоимость номера. Номер требует более тщательной уборки горничными, а также мелкого косметического ремонта. Холодно. Расположение- не далеко от вокзала. Тепло, уютно. Приятный персонал, быстро реагируют на любые обращения. Не мешало бы сделать ремонт. Цена не соответствует качеству. Охранник, ночью ходит за виски в магазин. Красавчик! Номер, душевая кабина, удобство расположения отеля, сауна. В гостиницу приехали уже поздно ночью. Но несмотря на это нас встретили, накормили. Персонал был вежлив и услужлив. Понравилось все. Все понравилось!!! Просторная комната. Хороший ортопедический матрас. Вежливый персонал и вкусный завтрак. уютно, чисто и комфортно! администратор вежлива, все вопросы которые возникали все объяснила! Отель отнеся с пониманием к моему раннему поселению ( поселение было в 7 утра), Спасибо! Все просьбы были исполнены. Отсутствие некоторых предметов гигиены, которые прописаны следующим образом "Также в номере есть одноразовый набор для личной гигиены: мыло, шампунь, шапочка для душа, гель для душа, зубная щетка, зубная паста", отсутствовали шапочка для душа))) зубная щетка, и зубная паста (за пасту небольшой минусик)) Также в номере не было утюга. Отелем доволен, сервисом тоже, как говориться нет придела совершенству! 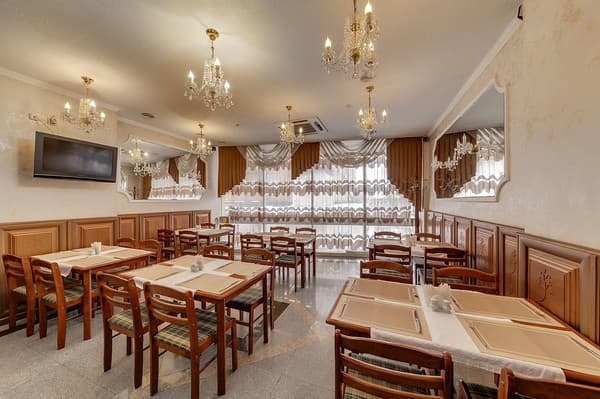 Located in the heart of the city Zaporozhye Lenin's prospect in the immediate vicinity of the railway and bus station.